Description of "ICSE EXCELSIOR STUDY NOTES MARCH 2019 ONWARDS ICSE EXCELSIOR STUDY NOTES (eBook)"
All the ten prescribed poems are included in the study notes.For an overview, there is a summary of the entire poem followed by questions and answers on the poem as a whole.Questions and answers stanza-wise provide an explanation of a given word or phrase as well as detailed facts. Focussed language helps you to express your answers concisely and coherently. A summary of each stanza wraps up your study of it. For rapid revision there is a Mind Map section with a visual layout of key points and vocabulary. Cherry Burke Ojha grew up in Allahabad where she went to St. Marys School and Intermediate College after which she attended the Allahabad University where she won several awards and earned a degree in English Literature, Philosophy and Education. Later she did a post-graduate degree in English from Madras University and added to that several teaching qualifications including CELTA from Cambridge ESOL, U.K. She has served as Principal of premier schools and now continues her work as English teacher, trainer and writer. She has written and published several e books on Creative Writing and Structural English for the benefit of students everywhere. In 2015 she was named one of twenty Woman Achievers of Bangalore and Beyond. 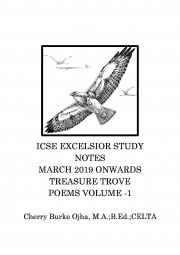 Reviews of "ICSE EXCELSIOR STUDY NOTES MARCH 2019 ONWARDS ICSE EXCELSIOR STUDY NOTES (eBook)"